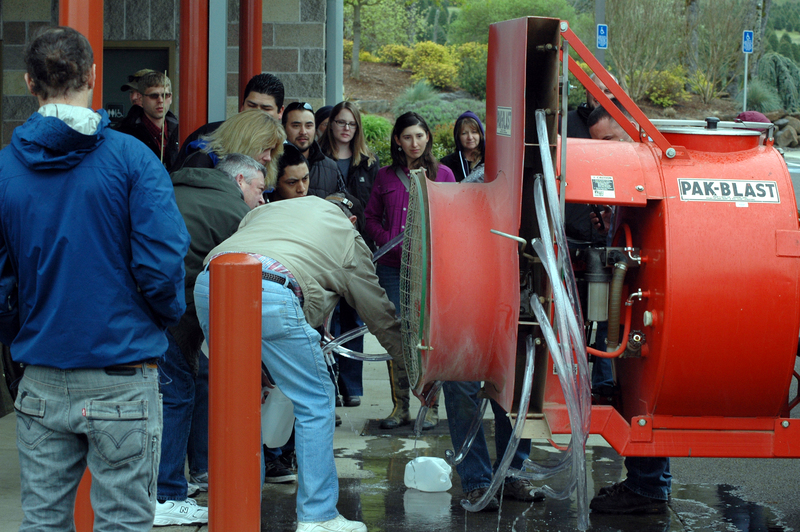 Workshop on how to calibrate an airblast sprayer. Many growers have difficulty controlling diseases and insects because they poorly time applications, improperly use equipment, or select inappropriate spray materials. Select the type of machine best suited for the orchard, nursery, or field in which it will be used. Consider such factors as the power available to handle spray equipment, acreage, and topography. Spray equipment should have enough pressure—whether straight hydraulic pressure or a combination of hydraulic pressure, air volume, and speed—to properly reach the tops of the largest trees. Concentrate, semiconcentrate, and speed sprayers have eliminated much of the labor involved with hand-type, high-pressure machines and have cut spray time. Travel speed is most important with concentrate, semiconcentrate, and speed sprayers because they have fixed outputs, and driving too fast means that not enough material covers the plants. From 90 to 120 feet per minute is about the proper speed when spraying mature trees. Air speed produced by the machine is very important. As the volume of air displaced is reduced, the air speed should be increased. Fans and engines of concentrate and semiconcentrate machines should be large enough to ensure moving about 7,000 to 10,000 cubic feet of air per minute at a speed of 85 to 140 miles per hour. To obtain the best from your equipment and materials remember the following. Whatever type of machine you use, it should be able to properly spray the largest trees in an orchard. Use manufacturer-recommended nozzle disk size openings. Check frequently for wear, unless you are using tungsten carbide steel or disks of similar material. If the pump cannot maintain pressure, it may be the disk opening has enlarged through wear. Check engine and pump speeds. Do not assume that the engine is up to proper revolutions per minute when throttle is wide open. Wash out the machine with clean water after completing spray applications. Keep all moving parts lubricated with the type of lubricant the manufacturer recommends. Drain all water from the machine before cold weather. Store valves and cages in a can of oil, and pump channels full of oil. Before mixing sprays, be sure you are using compatible chemicals. Use the quantities recommended in the OSU spray schedules. Make sure that all belts to the fan and pumps are under proper tension.